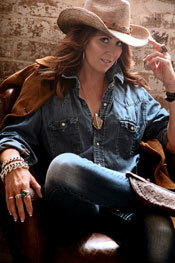 Jayne Denham is fast becoming one of Australia's most admired country rock performers. Her impressive and relentlessly energetic live show has seen her earn performance opportunities at all major Australian country music festivals. With her ability to tell a story that captures the imagination through her songs, Jayne has scored three #1 smash hits in Australia, six Top 10 songs in the National Country Charts, 12 videos that have reached the Top 30 as well as six Country Music Channel (CMC) and two CMAA Golden Guitar Award finalist placings. DYNAMIC performances and girl power define Jayne Denham's live shows. Country and rock music both run deep in her veins and she fuses them seamlessly to take her audiences on journeys through ballads of life and love to rocking tracks that will have listeners on their feet and all performances have crowds begging for more. The rapport she has with her audiences is evident in the chart positions she continues to snag, with her latest album, Calamity, reaching #4 on the iTunes Country Albums Chart, the first two singles, Stacks and Calamity, featured in the top 5 on the Australian Country Tracks Chart, and the single, Calamity, also reached the top 10 on Kix Country Radio. The album had more than 35,000 monthly listeners on Spotify within weeks of release and the single, Stacks, has reached 200,000 plays online already. As well as giving her audiences a good time, and something to talk about for weeks after they see her live, Jayne is also known for her songs that resonate with the trucking community. The singer-songwriter is passionate about raising the profile of the transport industry with tracks including her #1 Australian country single, Addicted to the Diesel. Jayne recorded her new album, Calamity, in the US, writing and recording with some of the biggest names around including producer Brian White, and writing with people including Jerry Salley, Phil Barton, and Jennifer Schott. The Australian artist recorded Calamity in the home studio belonging to Jay De Marcus of Rascal Flatts, who played bass on the album. The album features a mix of country rock with Stacks, Calamity and Highway Rock Star, and ballads like Fear of Flying and Black Coffee & White Lines. Jayne has entertained the VIP crowd at Keith Urban's Sydney shows and has been a featured performer at all major Australian country music festivals including CMC Rocks, Deni Ute Muster, Gympie Music Muster, Tamworth Country Music Festival, PBR rodeos, ute musters, B 'n' S balls and truck shows. Jayne has released four albums Sudden Change in Weather (2008), Shake This Town (2010), Renegade (2013) and Calamity (2018). The single, Chick Ute, from the debut album Sudden Change in Weather charted at #2 in Europe and Norway, #4 in Italy, #5 in the Netherlands and Denmark and #12 on the European Country Music Association Chart. Soon after the release of Sudden Change in Weather, Jayne Denham won the Australian Independent Country Music Award for Best Rising Star. Jayne's strong connection to the trucking industry has also earned her sponsorship from companies including Wickham Freight Lines, Scuzztrans Transport and, most recently, Lawrence Live Stock Transport. She has three promotional semi-trailers that can be spotted on Wickham Freight Lines' trucks up and down Australia's East Coast. A further six Top 10 Australian Country Radio Singles - Shake This Town No. 2, Trucker Chicks No. 4, Farmers Wife, Shelter No. 10, Stacks No. 4, Calamity No 4.